The author of Manipulated Lives studied journalism and communications but one would think she had a PhD in psychology. In this collection of five short novellas with a common theme, she has created true-to-life scenarios of how people are manipulated by others. I am certain you will recognize someone you know. She captures our interest and raises our awareness of these occurrences with characters we have all met at some point in our lives as we sadly watch them become victims of manipulators—often by those closest to them acting in the guise of love. Or worse yet, we might recognize ourselves as having been the manipulator in someone else’s life. These stories may cause you to squirm a bit. The writing is skillful as she draws us into the story much the same way the character is drawn to the manipulator, a seemingly innocent and believable attraction that slowly deteriorates into something unmanageable and quite twisted. I found myself cheering for the main character to become aware of what was happening in their lives and to run—to run quickly and not look back. I think it was quite masterful that the author carried out this theme with such a variety of characters, some young, some old, some vulnerable desperately seeking love and acceptance while others seemed confident and not likely to fall prey to such manipulation, yet they do. Is anyone safe? These stories, though short, pack a powerful punch. This book would be an excellent book club choice with its thought provoking situations. Holly’s story would be an especially interesting assignment for teens. Someone said the sign of a good book is when you continue to think about it once you are finished. It certainly has me thinking! 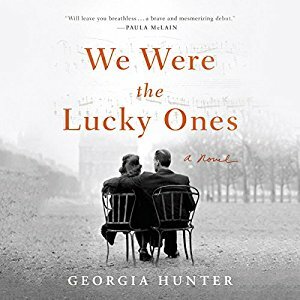 An extraordinary novel based on the true story of a family of Polish Jews who are separated at the start of the Second World War determined to survive-- and to reunite. Hunter took off on a nine-year journey, armed with a digital voice recorder, that took her around the globe. The result is her acclaimed book starring her ancestors, the Kurc family. Page one opens in the spring of 1939 in Radom, Poland, where three generations of this family are doing their best to live normal lives, even as the shadow of war looms closer. The talk around the Seder table is of new babies and budding romances. But soon the horrors become inescapable. Driven by an unwavering will to survive and by the fear that they may never see each other again, the Krucs must rely on hope, ingenuity and inner strength to persevere. This novel spans five continents in six years. It transports the reader from the jazz clubs of Paris to Karkow’s brutal prison to the ports of Northern Africa and the farthest reaches of the Siberian gulag. There are countless stories of WW II and often when I begin reading one, I wonder how it will differ from the others. This one, because it is based on truly incredible circumstances, renews the human spirit and yes, it is aptly titled. They were indeed the Lucky Ones.